High capacity, excellent tightness and free flow. These words aptly describe some of the superior properties of the ball segment valve. 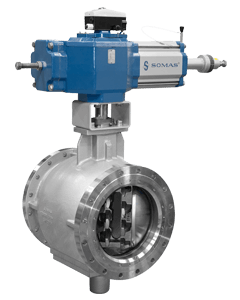 SOMAS ball segment valves have been designed to fulfill the strictest requirements of the process industry. Due to its free flow and choice of different materials for its housing and seat, the ball segment valve is usually the best choice for the industry. The ball segment valves high capacity comes from the design of its seat and ball segment. Compared to other valve designs it is often possible to use smaller and more economical valve sizes. 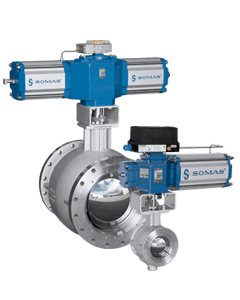 What sets SOMAS ball segment valves apart from many other manufacturers, is the fact that the entire valve is designed with a free flow in mind. This design philosophy minimizes the risk of clogging. The ball segment valve is first and foremost a control valve offering excellent tightness in the closed position. The properties of this valve make it useful for most applications. Combined with SOMAS pneumatic actuators and positioners the result is a flexible unit with a wide control range. A ball segment valve truly shines when used as a control valve. This means that the possible areas in which it can be installed and of use are virtually endless. The ball segment valve is right at home in most of the business areas. It can handle any form of substance such as fluid or gas. Even pulp is a non-issue thanks to the valves open flow characteristics. The valve can also be adjusted to handle medium consistency applications. Because the valve can be delivered with seats made out of different materials to fit your specific needs, it can handle varying temperatures with ease, both extremely cold (cryogenic) or extremely hot. SOMAS ball segment valve can handle it! For more information about ball segment valves, or any documentation related to any of our other products or services please click below.